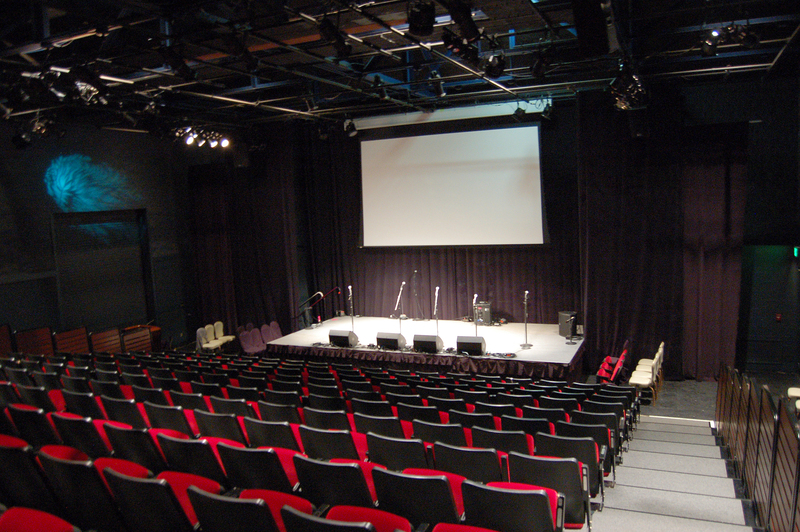 The McCoy Studio Theater is a black box approximately 53’6” wide and 56’ deep. 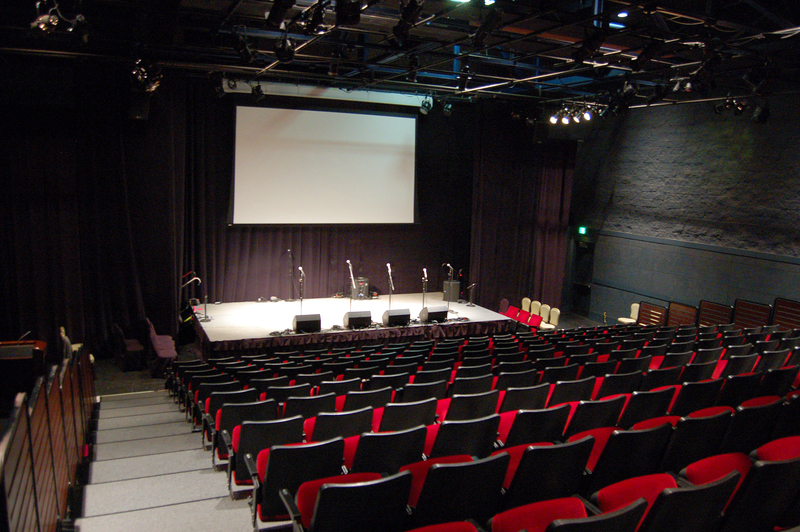 The default setup is with a stage at one end. The stage is 24’ wide by 12’ deep and 32” high. The opposite side of the room has a stairwell leading up to the control booth. The walls are 21' high and are constructed from textured cinder block painted a dark neutral grey. The bottom 9’ of the walls are covered with “Tectum,” an acoustical treatment. No screws, nails, tape, or similar articles may be driven or placed on any wall area. The theatrical lighting system includes enough lamps, dimming, color, & control for most functions, including meetings, concerts, and theatrical productions. A member of the Center's technical staff is usually required for operation of the lighting system. The room has both fluorescent and dimmable incandescent house lighting. The house lights can be controlled using the lighting console or by the portable "control station" in the light booth or the "wall station" which is just inside the main theater entrance. The theatrical instruments are a mixture of ellipsoidal lekos and LED 6in1 PAR fixtures for colored washes. Connectors are 20A stage pin. There are no follow spots in the theater. Instruments are hung on a ceiling-mounted wall-to-wall pipe GRID that allows for coverage over the entire room. The lighting grid is 20' 6" from the theater floor. The purpose of this grid is for hanging lights, however, curtains or other lightweight items may also be hung with the approval of the technical director. The only curtains in the theater include two panels of black velour against the upstage wall and a set of legs to create wings. The hanging of lights or other items must be done by a member of the Center's technical staff. The lighting controller is an ETC Express 48/96 or an ETC Obsession II. The lighting system consists of 50 circuits of 2.4K each using ETC Sensor dimmers and 4 more circuits for house lights using ETC Unison dimmers for a total of 54 channels. The audio console is a Soundcraft Delta 24x4x2 with a rack that contains EQ, effects, processing, playback, and communication. A Yamaha LS9 may be available as an alternative digital console. Main speakers are two Meyer UPA-1P front speakers (700w per cabinet) and two Meyer UPJ-1P delay/mid-room speakers (300w per cabinet). There are four JBL subwoofers with one 15” speaker in each (QSC Powerlight 2 @3000w). Stage monitors may be our Fulcrum FA12AC powered monitors if not in use in the Castle Theater, or EV 1202 speakers (12” & 1” horn). Upon request, we can email a Vectorworks file or a PDF of the House Lighting Plot.